[The Hollywood Reporter] L.A. Maitre D’s Reveal Diners’ Most Insane Special Requests! “Hold the cheese,” “no oil,” “dressing on the side” … Nothing surprises L.A. restaurant staff in a town of finicky diners, except perhaps these requests that some maitre d’s shared with THR. 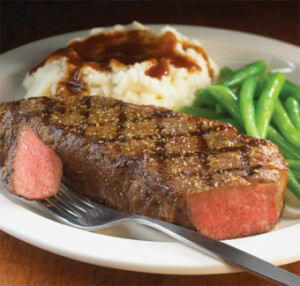 A celebrity asked to have a steak made and served in the private dining room so he could keep up the appearance of being a vegan. Yes, Bill was the guy ordering steaks on the sneak. So, former President Bill Clinton is a vegan. Except when he is eating eggs. Or fish. Or meat. Or wearing leather. President Bill Clinton has been telling everyone he is a vegan since 2009, but it turns out Clinton’s a liar. The former president, who has been enlisted to sell the nation on Obamacare, told reporters that he was joining his daughter, Chelsea, in an all vegan diet after he had had heart trouble. He was even named PETA’s person of the year in 2010. But in a recent interview with AARP, Clinton said he ate salmon and omelets once a week. “Once a week or so, [Clinton] will have a helping of organic salmon or an omelet made with omega-3-fortified eggs, to maintain iron, zinc and muscle mass,” wrote Joe Conason in the AARP magazine’s August/September 2013. “The way we consume food and what we consume” are driving up health care costs to unaffordable levels. “You have to make a conscious decision to change for your own well-being, and that of your family and your country,” he added. But while Clinton pushes veganism for the masses, the former president “has been known to stray.” Especially when he is overseas. When asked by Charlie Rose about her father’s diet in September 2012, Chelsea Clinton confirmed that her father had become a vegan. Frankly, we are shocked – shocked! -that Bill Clinton would say one thing in public and do another in private to maintain a certain image. We certainly hope that this is the only thing that he has ever lied about. Congratulations to Suzq , who was first with the correct answer! 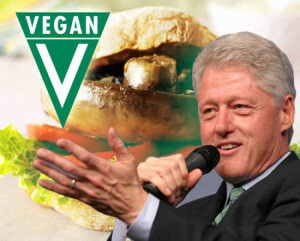 President Clinton strict vegan? On his doc’s advice he’s edged off just kale and spinach. Still eating healthy, it’s now limited amounts of fish and meat. Like the SOLVED items? Read more! Select the SOLVED tab at the top of the page or click here!